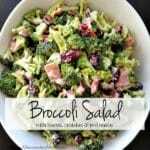 You’ll love this lighter version of Broccoli Salad with Bacon & Cranberries. It’s packed with crunchy broccoli, crispy bacon, tart cranberries and a tangy dressing. Combine the mayonnaise, brown sugar, honey, vinegar, salt, pepper and paprika in a small bowl. Mix until well blended. Combine broccoli, bacon, onion & dried cranberries in a large bowl. Add dressing and gently mix until broccoli is well coated. Nutritional information is provided only as a reference.